When the children arrived into the creche one morning recently they saw some thingspecial had covered the outdoor area! We didn’t need to ask them twice if they wanted to go our and touch the snow. Very quickly coats and hats were put on and the wetsuits and wellies were put on in record time. They ran out into the snow and touched it exclaiming “ it’s cold, feel it” they were telling each other. Michael and Fionn were making marks in the snow with their wellies leaving their prints everywhere. They then used different materials to make more prints on the snow. Parents were delighted to hear the children got to go outside and experience the snow. The children quickly spotted that it was a frosty and snowy morning and the hike area was covered in snow so we had to go on a hike. One of the children asked to bring the magnifying glass. We decided to bring 3 magnifying glasses and a bag so we could collect any interesting things that we found while looking at the snow and ice. 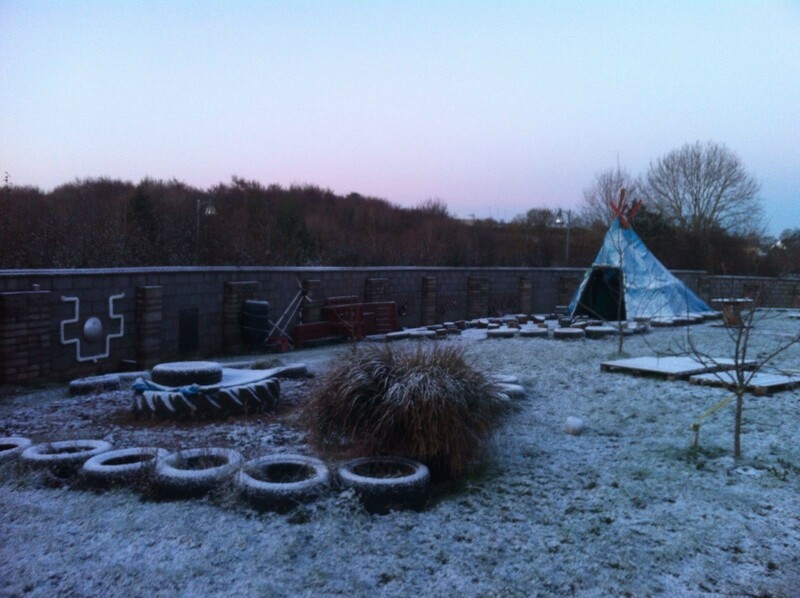 The children really enjoyed exploring in the snow making a snowman and snowballs. They also used their fingers to write in the snow. Others found some ice and watched in melt. We gathered some leaves that had frozen so we could examine them and talk about their texture. Tiarnan’s Mum said he liked seeing the snow from his house. Oisin was shaking the pot of flour and brought it over to Laura. She asked him if he wanted to play with it. You can guess his response! We took two trays and filled them with flour. The children enjoyed playing with the flour so much we then added some water to change the texture. As Callie was playing with the wet mixture pieces went flying around the room much to her delight as she laughed so much. One of the Mums commented that there was flour everywhere even in her son’s hair. Sorry!